With growing concerns of pollution and other health issues worldwide many governments as well as several health and environmental agencies have collaborated to effectively regulate and enforce the management of hazardous waste. With the implementation of specific rules and policies in many countries there seems to be a gradual improvement as it relates to waste management globally where people are observing proper waste management and disposal practices in effort to promote health, safety and a clean environment. To get more into detail when speaking about waste management it generally refers to all the activities and actions required to manage waste from its inception to its final disposal. It also functions to provide alternative solutions for recycling as well as the disposal of items that don’t belong to trash. Essentially this is done to encourage safe disposal of waste as well as to avoid pollution, serious injury or any other major health issues. As it relates to the disposal of hazardous waste there are many items that are deemed hazardous and illegal for regular disposal and should otherwise be discarded in a safe and compliant manner. Lawn and garden care products. Should any of these words be included in the label of a product or device it qualifies as hazardous waste and should not be thrown in with your trash or recyclable items. Apart from this other materials prohibited by law to be dumped as regular trash include explosives, ammunition, radioactive items, biomedical waste and tires. 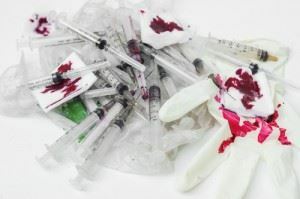 As for medical waste like needles, sharps and syringes discarding of them improperly can pose serious health risks to the public and to waste management personnel as diseases like Hepatitis A, C and HIV can be easily transmitted from needle sticks. These should be safely managed to prevent injury and disease transmission. Efforts to help raise awareness and to promote positive disposal practices throughout the world are gradually making a difference, safe and appropriate waste disposal practices can never be overly emphasized as it ensures the health and safety of the general public as well a clean environment for all. If you have hazardous waste and you don’t know how to manage give us a call at Junk King Marin right away. We specialize in the removal of all waste and would be happy to come in and assist you. For more information you can visit our website at www.junk-king.com. This entry was posted in Sonoma Junk Hauling, Sonoma Junk Recycling, Sonoma Junk Removal and tagged commercial waste, guerneville junk removal on July 5, 2017 by mattverga. Last updated July 7, 2017 .